The decisive step towards modern sculpture consisted of the addition of combination and construction to previous methods of sculpting and modelling. The use of sheet iron and wires was connected with it, in particular after Picasso’s first works. 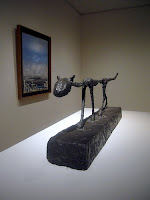 Picasso did not invent iron sculptures, although it may be true that there is a Spanish tradition behind them. The Spaniard Pablo Gargallo, who shared a studio with Picasso in Barcelona and followed him to Paris was already cutting figures and masks out of sheet copper. Given the contemporary general interest in tribal art, he may have linked the Spanish tradition with observation of hammered and chased African metalwork. Later Gargallo made it his own speciality. Julio Gonzalez did great progress with his sculpture probably when Picasso asked for his expert knowledge of smithing and welding to execute his projects. Gonzalez works established the new art form of iron sculpture. Owing to the material and the technique, the volume of a figure was reproduced by rods reaching into and surrounding space, by surfaces and rounded walls. This involved that inner penetration of figure and space that Gonzalez made the principle of his sculpture. The representations became, if not exactly abstract, at least figurative spatial diagrams. 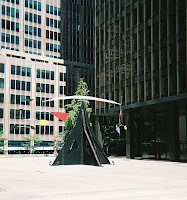 Calder was the artist who produced the most delicate wire sculpture. This mechanical engineer, who learnt to paint in New York, settled in Paris where he invented the toy like party mobile wire figures more suited to him. He put into practice the futuristic programme of sculpture made mobile with the help of hand- or motor-driven apparatuses. 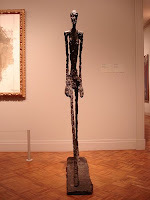 Giacometti was one of the main sculptors of the avant-garde. He emerged as with a new vision of sculpture which could have imitations, but no successors. During his formation he knew Rodin’s work, and when he went to Paris he entered in contact with all the previous avant-garde sculpture attempts, from ethnic works to those of the most important artists of the moment (Matisse, Picasso, Brancusi). He entered in contact with the surrealist and due to this his sculptures live because of their significant plastic formulation and the endless possible ways of interpreting them. His work in the thirties acquired the disturbing dimension which characterizes the Surrealism. From 1935 to 1945 Giacometti sought to reproduce the outward appearance of figures and head as we see them in reality: in the distance, in space, as a part of a much larger field of vision. He strove to introduce perspective into sculpture, at first making use of the methods employed by painters, such as a decrease in size and vaguer definition as the distance increases, large bases to set the figures off. He made many studies of passers-by in the street and after models in the studio and he transferred the shorthand stile of his drawings to sculpture. He discovered that making distant figures smaller was an unsatisfactory way of recreating reality. He found that the more accurate way of depicting people was their extreme elongation and slimness. His images are armatures of iron rods and plaster. His work sometimes remembers the finish used by Rodin in Caen’s Bourgeoisies.